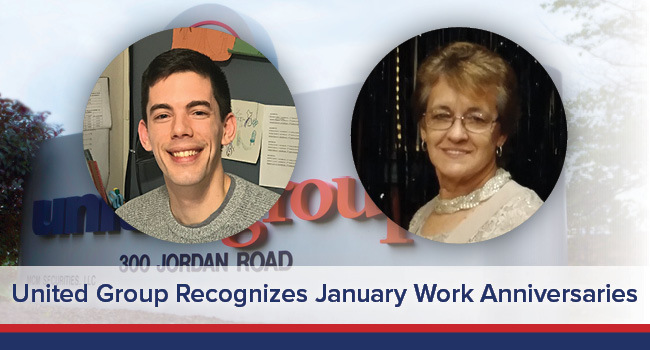 The United Group is thrilled to recognize two outstanding members of their team during the month of January. Winona Omasta and Max Jones are celebrating their tenth and fifth year, respectively, with United Group. Winona Omasta brought her talents to The Lodge at BridgeMill as a senior response agent ten years ago, and hasn’t looked back. She’s always willing to lend a helping hand to fellow employees and residents. Her dedication to The Lodge at BridgeMill has helped create a unique and satisfying living experience for countless residents. Max Jones began his career as an assistant property manager at Diamond Rock Terrace five years ago, and after briefly working at Mid-Rise Apartments, was promoted to property manager at Diamond Rock Terrace. Max’s calm and calculated approach to property management has been especially valuable for United Group. He takes great pride in his job, and truly cares about his residents and employees. United Group is very appreciative of the passion and hard work that Winona and Max have demonstrated throughout their careers. They continue to make a difference in their community’s and their resident’s lives every single day. Get to know Winona and Max, and hear about their experience with United Group! 1.) What do you remember about your first day with the United Group? Getting lost putting out memos. I was on the fourth floor, and could not find one of the apartment numbers, so I called the man who had trained me and explained that one of the apartment numbers was gone, and I couldn’t find it. He laughed and said, “go to the elevator and go to the first floor, you have to cross over to the other side.” Then, I laughed and said, “I’m not ready to cross over to the other side yet, I’m still young, and just now have a great place to work.” We had a good laugh. 2.) Are you in the same role? What has changed about your role? I do not, nor have I ever had a certain role: my title is Senior Response Agent. I have assisted in every role at The Lodge at BridgeMill, and that is what I enjoy. I love to assist others, and assist the residents. I have covered maintenance, activities, concierge, housekeeping, waitressing, dish washing, any job to keep this place going, I will cover. Busy, waiting on the residents and being at their command, filing and keeping all paper work updated. I’ve also had to find dentures, unstopped commodes, find hearing aids, keeping all office files updated, and enter the data into the computer for all other staff members. 4.) What do you love most about the United Group? They seem to care about their employees, and provide great insurance. I have never had any problems with United Group, everything is great, and a great company to work for. I am thankful for the day I applied to work here. 5.) What advice do you want to give yourself now, after working for the United Group during for past 10 years? Keep on working hard like I have for 10 years, (keeping the residents happy, so they want to keep living here,) work hard to keep our goals up. I LOVE MY JOB, I LOVE THE STAFF, I LOVE THE MANAGEMENT, I LOVE THE RESIDENTS, I LOVE THE LODGE AT BRIDGEMILL! BEST JOB I HAVE EVER HAD. I remember being extremely nervous and excited about starting a new job. I was introduced to the residents at an event we had that morning, everyone was very welcoming. My supervisor even treated me to lunch! Not quite, I started as an assistant manager at Diamond Rock Terrace then received a promotion and transferred to Mid-Rise Apartments as the property manager. Eventually I made my way back to Diamond Rock Terrace as the property manager and I’m still here today. There is no average day in property management! Every day is fast paced and presents all types of different challenges. There was a resident named Connie who baked the most wonderful homemade cookies and delivered them with a big smile every Friday morning. On my first Friday she came into the office, gave me a huge hug, and told me to eat up. I knew I was in the right place. 5.) What do you love most about the United Group? The emphasis and value that is placed on employee growth and development. All of my supervisors have pushed me toward continuing my education, earning more certifications, and making myself a better employee. 6.) What advice do you want to give yourself now, after working for the United Group during for past 5 years?